The playground and Facebook are full of talk about Hallowe’en. Even “Are the kids going out guising?” has replaced “Mingin’ weather, isn’t it?” as the usual morning greeting between neighbours. Guising… Yeah. It’s what we’re doing instead of Trick or Treating. Call me a rabid, old-fashioned, stick in the mud if you must, but this family isn’t going to take on an American tradition that has strong overtones of threats, violence, begging and social disorder (! 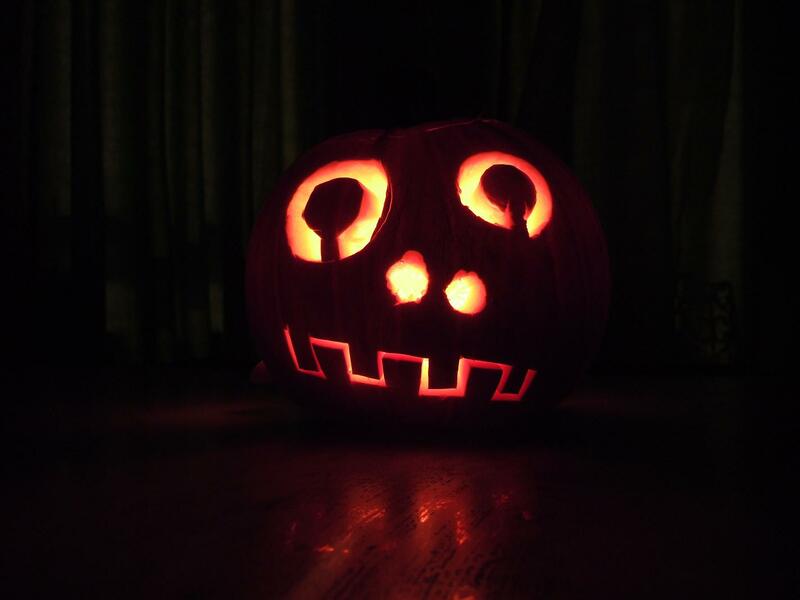 We’ve got that down pat already, thanks…) When I was a child, going round the neighbours’ houses on Hallowe’en night, dressed up, was called guising. You knocked, you showed off your outfit and saw if the neighbour could see through your disguise. Then you had to perform – a little song, dance or joke (everyone went for joke) – and in return you were given tangerines, peanuts, sometimes sweets and very occasionally some money. One good import from the States, though, is that the lit pumpkin outside the door has become the Internationally Recognised Symbol of ‘this is a Hallowe’en-friendly house, feel free to knock’. As the minxes have never been out guising before, we’re only going to knock on the doors of friends and neighbours who I’ve already cleared it with in advance, or people we know with lit pumpkins outside. I suspect what will happen is that all the families will all be out at the same time and we’ll all just cross on the street. Maybe I’ll take a sack of goodies with us, then…? I understand that some Christians have an issue with children mimicking and dressing up as witches. Actually, I do understand that point of view: it does follow-on logically that if you believe that there is an actual Devil, wreaking havoc in the world, then it’s not great to dress-up and pretend to be one of his followers. I don’t hold that view, personally, but can see where folk are coming from. At the school that’s not really an issue because rather than have Hallowe’en parties or dress-ups, they have one of the regular ‘Come As You Please’ days instead. So yeah, the world and his dog is dressed for Hallowe’en, but the children who don’t want to be witches, devils, scary things, can come in jeans and tee-shirts or as fairies or whatever, and it’s not necessarily for Hallowe’en. Maxi and Midi wanted to be Harry Potter and Hermione. Eh? Sheesh, in my day everyone wanted to be a punk. That was easy. How do you turn a girly-girl of 6 into a teenage boy? The minxes have 2 boxes full of dress-up clothes, but the requirement was for home-made fancy dress. It’s amazing how satisfied little kids are with some bin-bags, wrapping paper and an old pair of Daddy’s glasses, eh? And when they’re old enough not to be, they can dress-up themselves. 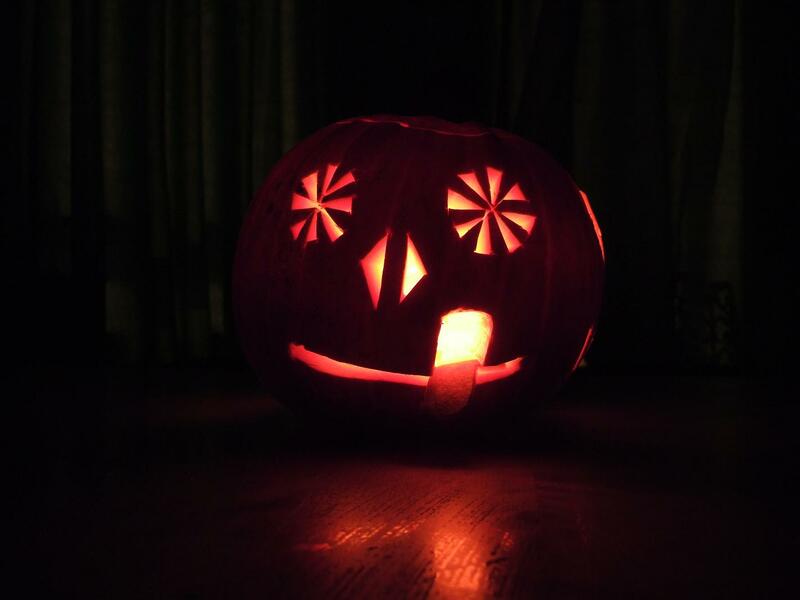 One thing me and The Boss aren’t going to relinquish though – carving the pumpkin! Ahhhh, Hallowe’en… the first milestone of fun on the run-up to Christmas. I might be an old fart now, but I still feel the faint shadows of the excitement I felt as a child in fancy-dress. Maybe I’ll get busy with the bin-bags, cling-film and face-paint myself later on? Now that will properly frighten the kids! This entry was posted in baby milestone, clothes, Out and About and tagged guising, Halloween, Trick-or-treating by GrumpyOldTrout. Bookmark the permalink. Loving the concept of guising – many a fresh-faced witch or wizard has looked a bit perplexed when I inform them I expect a joke or a song before I dole out the goodies, but nearly all have risen to the challenge. I failed dismally with the lit pumpkins this year, tho as I realised too late I only had one tealight left and then that one promptly got snuffed out! 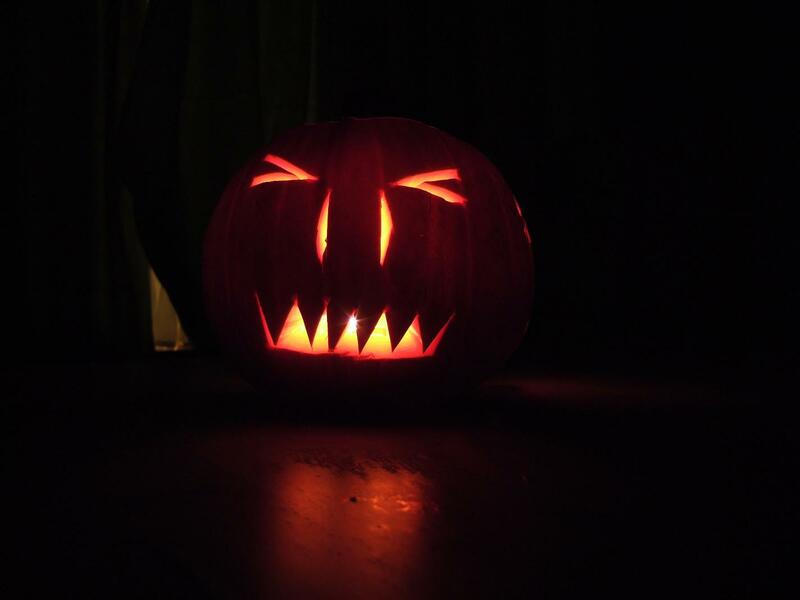 Intend to spend between now and next halloween restocking my tealight supply and inventing gust proof pumpkin designs!